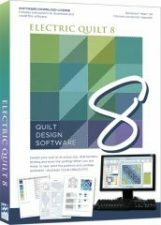 The Electric Quilt Company began in 1991 and today is the leading quilt design software company in the world. I have been using the software since EQ3 and teaching classes since EQ5, faithfully upgrading from version to version until here we are at EQ8! EQ7 owners can upgrade to EQ8 for a reduced price, available as of October 23rd 2017, and for a limited time the upgrade price will be reduced by 25%. Introductory pricing is available until November 6th, 2017. EQ6 and EQ Mini owners can also upgrade to EQ8 for a slightly reduced price. New EQ8 licenses will be available for PC and Mac users as of November 13th 2017. So what’s new in EQ8? The biggest change you will notice is the updated user interface. EQ7 looked pretty much the same as EQ6, but EQ8 has a fresh and modern new look. It has been redesigned for faster learning, with clearly labeled tools and larger, customizable interface elements. The new Home Screen conveniently directs you to the most commonly used actions quickly and easily. Choose from large, labeled tools, or small tools. Tips in the palette can be visible, or hidden. 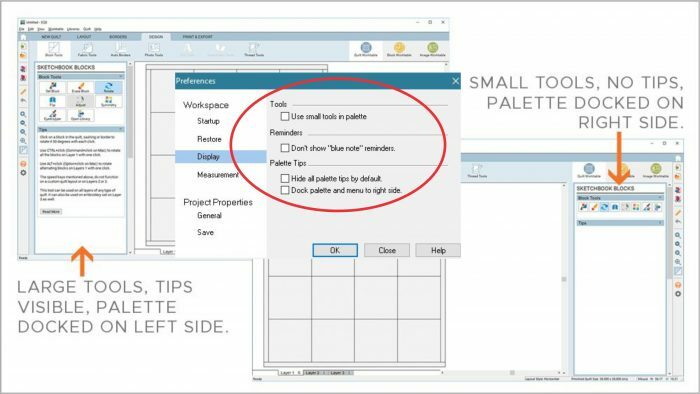 Palettes can dock on the right or left side of the screen and expanded larger to view more items at a time. Use the Preferences dialog to see all the customizing capabilities. This is how the Quilt Worktable looks in EQ7. To get to the Quilt Worktable, you click on the red “Work on Quilt” button on the top toolbar. To place fabrics in the quilt, you choose a tool on the right toolbar such as the Paintbrush Tool and select a fabric from the swatches in your Sketchbook. A preview of the swatch appears at the top of the palette. 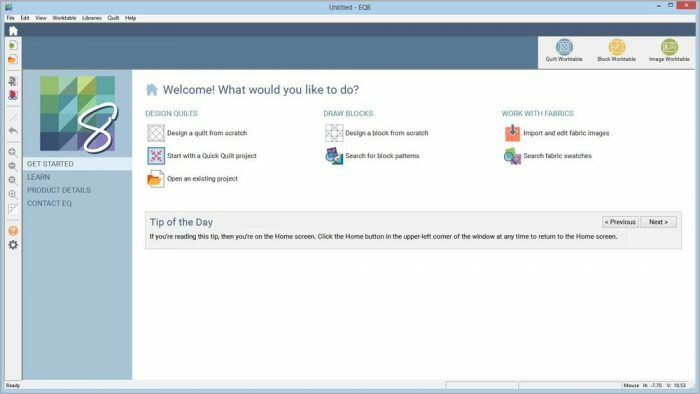 In EQ8, accessing the Quilt Worktable is clearly marked as is the Paintbrush Tool. Clicking on “Fabric Tools” opens all the options along with the fabric swatches in your Sketchbook. A large and resizable fabric preview screen helps you see exactly what the fabric will look like. PatchDraw in EQ7 is now called PolyDraw in EQ8 and it has been vastly improved. This powerful utility is particularly useful for drawing patches with curved lines but my students often find PatchDraw difficult to master. In EQ7, first you have to click and hold on the PolyDraw tool to select the PolyArc tool. Next, you click on the first corner of the patch you wish to draw. This releases a blue “rubber band” indicating where the first line will go. Clicking on the second corner will snap the line in place along the grid, releasing the “rubber band” for the next line. The final corner must be double-clicked to complete the patch. In EQ8, the PolyArc tool is clearly labeled under Drawing Tools. Now, you double-click to begin drawing and click on each corner of the patch until it is completed. WreathMaker in EQ7 required a lot of guesswork. Until you clicked “OK”, you didn’t know what the wreath would look like. The process involved changing the values for Number of Clusters, Cluster Spacing and Resize Cluster. To make a change, you would have to Undo the WreathMaker, try new values, and click OK again. WreathMaker in EQ8 now features an interactive preview, which takes the guessing game out of creating beautiful wreath designs. If the improved WreathMaker tool isn’t exciting enough, there are even more new appliqué drawing tools in EQ8: StarMaker and PosieMaker. StarMaker allows you to choose the number of points, the size of the center, and the style of the inner and outer points – all with the same interactive preview. PosieMaker allows you to choose the edge style, number of repeats, the size of the center, and adjust the shape of the petals. And there’s a whole lot more! Stay tuned for Part 2 next week when we will review more of what’s new in EQ8.